Sculptures created for VISA110 Adv. Foundations and VISA1420 Kinetic Sculpture at Brown. Metalworking steel project created for VISA1420 Kinetic Sculpture at Brown. Winter 2015. Filed under Sculpture. Mixed media final sculpture for VISA1420 Kinetic Sculpture at Brown. Spring 2015. Filed under Sculpture. Wood sculpture created for VISA1420 Kinetic Sculpture. Blades power a centrifugal governor, which swings out to hit the metal plates at high wind speeds. Final project for VISA110 Adv. Foundations at Brown. I wished to examine the idea of a mobile home, imagining an abandoned warship that has been taken over as a steampunk style mobile home. 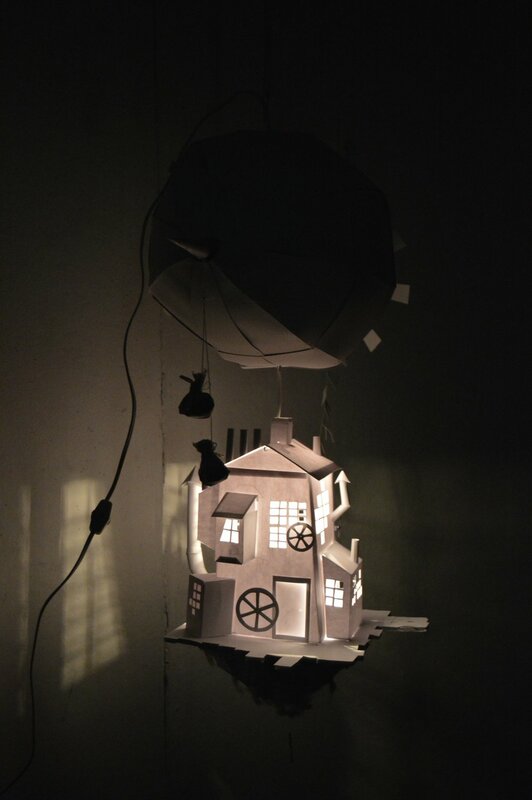 Mixed media (rope, cut paper, foam core, cotton, lamp, light, shadow). Fall 2014. Filed under Paper Cutting, Sculpture.